Gold prices edged higher on Thursday and moved within striking distance of two-week tops set in the previous session. A combination of supporting factors helped the precious metal to regain positive traction on Wednesday and build on last week's bullish rebound from one-month lows. But mainly the returning selling pressure on the greenback was the key factor for Gold to break to the upside as US durable goods orders data printed negatively. An additional boost also came after statements claiming that the Fed might pause the rate hike cycle as early as spring 2019. 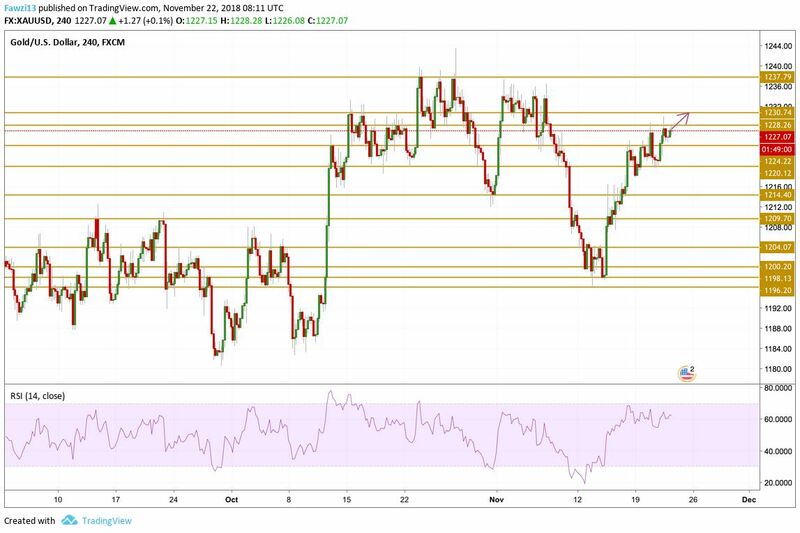 Gold regained traction during yesterday’s session and aimed for the $1230 level, however it faced a strong resistance in that area and settled just below the $1228.26 resistance level. Trading in a very tight range, the price is still firm with a bullish momentum at the momentum and seems to build a traction in order to settle above near resistance points. That is why will be focusing on the $1230.74 level.